A lightweight synthetic saddle made to fit today’s gaited horses, this trail saddle features rounded skirts for freedom of movement, ideal for short coupled horses. It's great for everyday riding or trail riding, with tough nylon synthetic skirts and fenders, handsome leather jockeys, pommel and cantle, nylon tie straps, reinforced stirrup bars, Tough1 quick change buckles, saddle strings and tie rings, padded leather stirrups and padded smooth leather seat. Perfect for gaited horse who is "round" with short back. Like the smooth seat as can swivel to match her gaits. She loves it as so much as so much lighter than my old Circle Y saddle. Saddle is light enough so can easily lift it and throw on her back. Fits very well. Would definitely recommend this saddle, particularly for gaited horse. Weird fit, not my favorite. I have a TWH, high withers, short back, and I did not find this saddle to be a great fit. The skirt is 26” which comes to the very edge of my 30 x 30 Pad- you will need a 32” pad. The cinch “leathers” are nylon and slippery which makes it hard for the saddle to stay firm in place. The leg position is a tad far back and I feel they don’t allow for comfortable bend at the knee. It feels like they go straight down into the stirrup. The saddle says gaited but it fits more like a typical semi QH bars saddle and doesn’t have the fit I was looking for. Overall it is very light weight and padded which is great except the position is really uncomfortable so I will not be able to use this for long trail rides. I got this saddle while on sale and I am glad, while it will suffice for now I would not buy again. Works great, only problem tie strap to girth no holes?! Great saddle. The seat padding is at least an inch thick. The saddle fit perfect on my TWH and lasted through a 19 mike trail. Definitely recommend! Got this for Husband's Birthday. Shipped quickly. Saddle is light and seems to fit this high withered TWH Cross well. Stirrups are easily adjusted and we like the horn feature that most Endurance Saddles do not have. Looking forward to some serious trail rides. Great looking saddle only ridden 2 times ,feels good so far .Looking forward to riding more when weather warms up . Once again Royal King did it!!!.. Another GREAT Saddle, very comfortable for me and my horse. No Cons at all. Perfect fit, love all the d rings and ties. Thank You again for a wonderful product. This saddle fits both my Appaloosa and my Tennessee Walker. Saddle is lightweight and fits my Tennessee walker great. I wanted a saddle that I could lift easily and fit both of my Tennessee walkers. This saddle is lightweight, made well and fits both horses great. No saddle sores on either one. Cinch strap that comes with it is short and hard to get the saddle right but I bought a longer one and it works great. Love this saddle. Wanted a light saddle to fit GTW, Sure hope this fits the horse and me. I chose this saddle because I needed a lightweight saddle for a Tennessee Walker/Fox Trotter mix who is hard to fit. 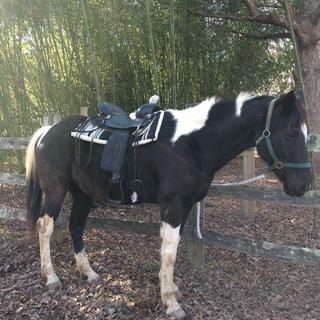 We just purchased a Tennessee walker and needed a good saddle for him. I've always bought King Series Saddles and love them. they are comfortable, sturdy and stand up to a beating. ( I had a horse roll in one).I stand by King Series Saddles. I was looking for a light weight saddle for my daughter and this looks perfect! I have a hard to fit horse and saw the reviews and wanted to try the King Series gaited saddle. I am partial to synthetic saddle for ease of care and hope this will be no exception. Still waiting about the high withers ? and the gullet pic to see how the bars lay. I don't want to have a restocking fee because it is to steep of an angle on the bars. My horse uses a 7" gullet on his saddle now but it is a qt. saddle and comes in contact with withers now that he has aged behind the swell but he still has wide shoulders with a hollow behind. The seat no longer fits me and I want to reduce the weight for me to lift on. I looked at a Big Horn but didn't like the lay of their bars too steep even though it was a 7" gullet. BEST ANSWER: WEIGHT: 18 lbs. Is this saddle appropriate for a high withered standardbred? BEST ANSWER: It depends on how wide your horse is. This saddle has a 7" gullet. The pommel is fairly high and should give enough clearance for a high withered horse as long as the gullet fits properly. I hope I am getting back to you soon enough. Yes, this saddle is good for high withered horses. My TWH is 16.2 with a narrow chest and high withers. I do have some concerns about the saddle. The latigo is nylon webbing and stretches way too much. After 4 cinch checks I still had problems with stretching resulting in having to constantly telling my rider to center his saddle. On our first ride the d-rings both came off from the saddle. I emailed and called Stateline for help on replacement or repair and never got anywhere. I am not certain just yet about the quality of this saddle and will be able to honestly give t a rating after more rides. I hope this helps everyone . I have this saddle on my Tennessee walker. It's been difficult for me to find a saddle that fits her. Her withers aren't extremely high, but she has a very narrow back. I'm used to quarter horses so she's been different for me. This saddle fits her the best, although the back of the saddle still sits a little high on her rump. I'm hoping if I buy a flank cinch then that should help it not sit high on her back. All in all its a good saddle for a great price! I hope this helps! I have an elderly thoroughbred. High withered and on the thin side. I purchased this saddle and it seems to fit him fine. I don't ride him a lot, just a few times a month, but he has not had any problems at all. The saddle is comfortable and light, which is what I need since I have a disability that limits my ability to lift over my shoulders. Should be. I have a 15-15.5 and it fits my spotted saddle horse with lots of room to spare on the withers. He is not high withered, but there is plenty of room. Very comfortable for me and he is find with it. How long is the longest part of the skirt length? I have a short backed TWH and also wondered if a 30 x 30 pad would work with it? BEST ANSWER: The skirt length right behind the saddle seat is about 23.5 to 24 inches. I have a small (14.2) short-backed Missouri Foxtrotter/Tennessee Walker/ Warmblood cross and it works great on her. It is not too long for her. There is plenty of room for her big shoulder movement and it does not interfere with her very active back end movement. I use a 30" by 30" pad with it and it works great. 22" x 26.5" is the skirt size on this saddle. Thanks! Yes I saw that in the descriptions. Is it 22 inches wide and 26 inches long? Iâ€™ve never heard of a saddle measured by width. How LONG only isnit please? Thanks! The length of this saddle's skirt is 26.5"! Would this be good for a Rocky Mountain? BEST ANSWER: This saddle has gaited bars, a shorter skirt, higher gullet and sits back further on the horse to free up movement in the shoulders of a gaited horse. Along with the appropriate padding, it should do well for most gaited horse types. It always best to contact a local person with experience fitting saddles if you are unsure on the best saddle option for your horse. Good Luck! I normally use it on a 14-3 hand spotted saddle horse, but we have a Rocky Mountain and I am sure it would be good on him. Both horses are fairly short-backed. Very comfortable and light weight. Did not fit my fox trotter. Very wide and poor quality. Is the saddle open all the way through underneath or is it stitch at the back underneath ? BEST ANSWER: The gullet channel is open all the way through. I own a old style Morgan. He does not have a fancy gait. Although he does have a fast stepping pace all the time. I trail ride with him and he's does this fast pace the whole time. I love it. I am using a western saddle now but, I'm wondering if a gaited saddle would be more comfortable for him? I raise Morgans and have several that have that extra quick pace. It is an extra gait called single footing. Not the same as a Walker or Rocky Mountain. I have a Missouri Foxtrotter gaited very fast. I love it too. I do t enjoy a slow pace! This is much more comfortable and he seems to love it. will this work for an Arabian? BEST ANSWER: The King Series has gaited bars and the skirt is 26" x 22 1/2". It is possible this saddle would work for an Arabian horse, however, you should check with your horse professional. Question is my horse is a short back Missouri Fox Trotter pretty round and has no Withers. How wide is the tree? BEST ANSWER: I have a Rocky Mtn Mare who is quite round but has withers. The saddle fits her perfectly and she loves it after riding her in a very heavy Circle Y saddle. It's really great for gaited horses as you can easily swivel in the saddle to match her gait. Improved my riding a lot! Can't tell you how wide the tree is but it fits her and she is round with a pretty short back as well. I would recommend it. Tree was way too wide for my TW. Saddle was two inches longer than my leather saddle. Fit more like a western saddle for QH. Restocking fee and shipping were so high I just took it to a tack shop to sell for me. I would not order another saddle by mail! As far as the saddle I liked the quality for the price; I'm sorry it didn't work for the horse! I bought this saddle for a Missouri Foxtrotter/Tennessee Walker cross. She also is short-backed and is hard to fit. This saddle should be wide enough for your horse.I would call it a wide tree. It flares at the front as well to allow for shoulder movement and is very comfortable for horse and rider. I think it could fit, the tree is quite wide. It was too wide for my TB who has a pretty high withers. To handle. I ride with it on 16hd KY MYN. I also bought this and have a MFT. Not sure of the width but itâ€™s perfect for him. This saddle has gaited bars with a 7" gullet. I also have a hard time getting the right fit for my TWH. This saddle was way to wide in the front for his high withers. To me this is not a true gaited saddle. Sits too low on shoulder blades for correct movement. If your horse is wide like a quarter horse it might fit. It would cost almost !00.00 to return with freight and restocking fee. I choose to sell it at a local tack shop instead. Still waiting for a buyer! The saddle itself is very nice. I would love to find one to fit my horse as nice as this is for the price. Good value! I bought this saddle and have not used it. It looks ok, however one stirrup fender is smaller than the other. I put it on my TWH and tried to mount, but the saddle kept slipping. I plan on switching out the cordura stirrups fenders with leather ones and switching out the cinch and latigo and adding a back cinch and breast collar. The saddle seems well built and seemed to have fit him ok. Better than my longer saddles. Hope this helps. I don't know about their return policy and/or a restocking fee but I bought this saddle for my gelding TWH- he's 16-2 & it fits him well- I've been very pleased with it! Know N.H. is not a good fit for a TWH. The width needed for a gaited horse does not extend the entire tree. There is a restocking fee. Not a true fit for gaited horses! You will have to contact SLT for that. I noted that the rigging is on the wrong side of my saddle. I do like the saddle, however. How wide is the gullet on this saddle? The gullet ranges 3.5 to 4". It is wide enough to keep any horse comfortable. BEST ANSWER: I really loved this saddle in every way except I did need a wither pad for my high withered mft. I'd still but it again though, nice saddle for the price, and very comfy! Honestly, it is high withered but I still had to get a blanket with support inserts to raise it more in the front. My boys are very lean and it had the right shape nice skirt to it just needed to raise it more. BEST ANSWER: Item is sold on jt international in the size 17 in, we only carry the sizing listed on our website. This saddle is does come in a 17" in black or brown.